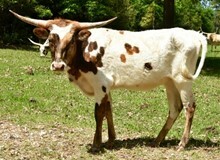 This medium-sized black and white cow has good conformation, lateral horn shape with an unique forward twist, and a total horn length close to 90 inches. Mo Baby has mellowed with age, takes cubes by hand and likes an occasional head scratch. Mo Baby IV is loaded with great genetics and a produced prize-winning calf, TCR Ruby in December 2012. TCR Ruby, with similar markings as her dam, won her age-group at the ITLA Championship Show and Futurity in Oklahoma City in 2013 and 2014, and the Houston Livestock Show & Rodeo 2015. Artificial Insemination Rodeo Max Long-bodied, muscular brown & black bull with 83 inch horns.